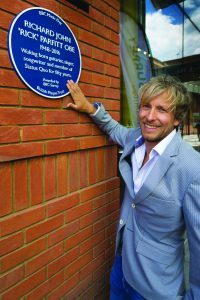 WOKING-born rock star Rick Parfitt has been honoured with a BBC Music Day Blue Plaque. The tribute to the Status Quo legend, who died on Christmas Eve last year, was unveiled in Jubilee Square, Woking by his son, Rick Parfitt Junior, and singer-songwriter Newton Faulkner. Dozens of people, including Rick’s second wife Patty, original Status Quo drummer John Coghlan and Woking Mayor Graham Cundy, watched the unveiling ceremony on this year’s Music Day, last Thursday. Rick Junior said as the plaque was revealed: “He absolutely would have thought that he wasn’t worthy of this. Rick was chosen for the honour, one of 47 Music Day plaques awarded, by BBC Surrey after a vote by listeners suggesting people or places that have influenced the musical landscape across the country. The tribute commemorates Richard John ‘Rick’ Parfitt OBE 1948-2016, guitarist, singer, songwriter, who was a member of Status Quo for 50 years.